Warily dancing to your own. John Wain, a famous English Poet, once mentioned that “poetry is to prose as dancing is to walking.” I think I was fully able to comprehend his statement when I watched this 15 year old lady dance. It was not only the dance; it was more of the look in her eyes, the motivation, dedication and respect that she constantly exposed to the art that struck me. And when I saw her practice, it was no longer a surprise why she won 1st prize in Kathak in the recent 2008 Shilpokola Academy 14-25 year old dance competition. Tahmina Anwar Anika started dancing from when she was only 3 and half years old. Pretty much dazed by her own achievements, she started winning dance competitions almost immediately. With Munmun Ahmad being her first teacher, Tahmina since then was trained by several prominent teachers including Pandit Krishon Mohon Misro and Guru Belaet Hossain Khan. Her first big event was when she was only 5 and half years old at BM Auditorium following which she won her first 1st prize in Kathak at Jatiyo Shishu Competition, 2000. Only at 15, she has already lost count of the number of prizes and stage performances she performed! Of course things didn't just come easily. Dancing is pretty much a very integral part of Tahmina's life. As she mentions, she spends at least 2-3 hours per day practicing, desperately struggling between a horde of performances and her studies. For those of you who have seen Kathak, it does involve a lot of intricate foot “stomping”. Of course the first question that came to my mind when she said so was, “Doesn't your feet hurt?” Her reply was pretty simple, “Yes like hell; but I guess you eventually get used to it.” Clearly, if she ever learns martial arts, her kicks will be deadly! While chit chatting, Tahmina mentioned that her favorite dance till now was to a Sufiyana song in the recent 2008 Shilpokola event. What I found interesting however was that she mentioned that the poignant words of the song helped her feel the dance more giving her a sentiment that she was the song through her dance. Talk about high thoughts! She also cited that during a Shilpokola event at 2006, her right foot got cut when she entered the stage and started bleeding badly; even still she continued her dance flawlessly maintaining her expressions! Although it resulted in a blood filled stage, Tahmina made sure that the show went on. Now, that is dedication. One thing that this dancing lady however finds annoying is the extreme make-up required for every performance. Same here; that is I will never be able to understand how on earth dancers mange to be so graceful and exuberant with their dances while having so many layers of make up on and God knows how many kilograms of ornaments; but clearly they do a good job with it. This one time Tahmina recalls she was so heavily decorated that this fokir (not me, an actual one) said, “dui ta taka den na, notun bou-er jonno dowa kormu.” Clearly the beggar was not aware of the immorality of child marriage. Other than dancing, Tahmina also sings, takes part in short dramas, plays the piano and rocks at her studies! Talk about a heavily concentrated talent hub! Planning to be a doctor while holding on to her dancing carrier, with her extreme jedh and self-motivation, she is sure to succeed in almost anything and everything. Out of the several dances she knows, Kathak is her favorite and her forte in which she has already been declared as the next “rising star” by many. I frankly think she already is one. Her list of awards includes, just to name a few, 1st prize in “Classical Dance” category four times in a row from 2000 to 2003 in Jatiyo Shishu Kishor Competition while shuffling between 1st and 2nd from 2002 to 2005 in BTV Notun Kuri Competitions. Matahari, a famous Indonesian dancer once said, “To watch us to dance is to hear our hearts speak;” I think this single line summarizes the true essence of this mesmerizing art. Tahmina would like to thank the Almighty, her mother Anwara Begun, her father Anwar Hossain, her teachers, especially Pandit Krishon Mohon Misro and her friends for all their continual support. Undoubtedly, this is just the beginning of a wonderful dancing journey for this 15 year old lady; she is sure to amaze us a lot more. I gaze at one of the huge 'Moai' statues. The grim face is staring up at the sky, and yet seems to know that I cannot take my eyes off the huge crown-like object that sits on his head. It is uncanny. Maybe he understands what I feel; as though he has been a silent witness of all that has happened throughout the centuries. If only he could talk to me and tell me. Who made these beautiful statues at Easter Island? How were they moved? What happened to the people who made them? All these questions come to my head as I look at the picture on my computer screen. I want to know more about this mystery of history. Easter Island, also known as "Rapa Nui" and "Isla de Pascua", has long been the subject of curiosity and speculation. It is the home to the huge monoliths known as 'Moai'. 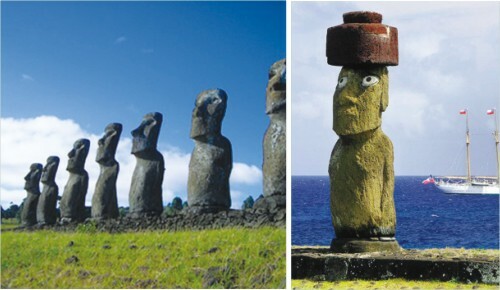 The more than 887 statues (according to wikipedia) enhance the beautiful island on the Pacific Ocean. 53 of them were carved from tuff (a compressed volcanic ash), 13 moai carved from basalt, 22 from trachyte (volcanic rock) and 17 from fragile red scoria (porous rock). There has been much controversy and confusion concerning the origins of the Easter Islanders. Thor Heyerdahl proposed that the people who built the statues were of Peruvian descent, due to a similarity between Rapa Nui and Incan stonework. Some have suggested that Easter Island is the remnant of a lost continent, or the result of an extra-terrestrial influence. Archaeological evidence, however, indicates discovery of the island by Polynesians at about 400 AD. Easter Island today, remains one of the most unique places you will ever encounter; an open air museum showcasing a fascinating, but unfortunately lost, culture. The landscape is truly amazing - with its volcanic craters, lava formations, beaches, brilliant blue water, and archaeological sites. It's always stimulating to watch anime that embraces complex nuances and a cynical, satirical outlook. They're indicative of the vagaries of present day life and this empathy works well. However, sometimes you want to forget it all and embrace simplicity. Screw logic. Screw reason. It's time to break through the heavens with naught but sheer belief. Belief in yourself. Belief in others who believe in you. It's time to follow Kamina and Simon into a realm where impossibility is only a state of mind. With this unerring sense of blind faith, Gurren-Lagann forges ahead with panache. It's a heart-warming tale of growing up and grasping one's destiny with a clenched fist and a wide grin that defies the most formidable of challenges. The very concept is a heavily perfumed love letter to mecha anime of yore with its melodramatic characters, epic battles and passionate themes. It's so full of energy that you can't but help get caught up in its fervour. This intensity is best expressed throught the artwork. Insane and utterly vibrant, it's a visual assault of the highest calibre. It eschews the standard sleek, streamlined style of current mecha design for chunky, disproportionate and garish robots that are infused with the same lunacy as the characters that pilot them. Defying all logic (which is, after all, a key theme) these mecha move and fight with little regard to the fact that they're even mechanical. The characters themselves are designed in a way that each of them are bursting with personality and style; even the most insignificant character isn't belittled. Never a still frame, the utterly fluid, irreverent art style truly captures the imagination. The characters are the soul of this show. In an anime where the unexpected is not an option, these personas seem to fill every possible niche. But there's more to them than is evident. 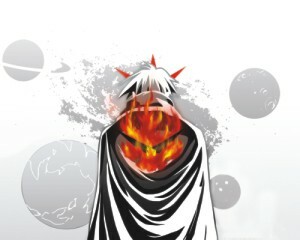 Buoyed by Kamina's infinite reserve of belief, they showcase facets of themselves you thought they never would. And throughout the entire run of the series, you'll watch them grow in surprising ways, particularly Simon. There's trust, there's friendship, love and loss. Despite its manic outlook, Gurren-Lagann knows how to seek synergy with the viewer. It's truly hard to point out flaws in Gurren-Lagann because it embodies so much of its own identity, all the while deeply respecting its heritage, that it seems to transcend a lot of anime. If anything, it's that the episodes are rather formulaic to a fault. Regardless of the danger that takes place within a chapter, it will never fail to end on a happier note. Whether it's a Giga Drill Breaker to win the fight or an overwhelming surge of belief to drive the Dai-Gurren Brigade forward, there's no shortage of smiles. The cynics among you will be rolling their eyes in no time, but I loved it. Simple, passionate and absolutely insane, Gurren-Lagann embodies a beautiful, personal message that should hearten just about anyone. When all else fails, look to the heavens and pierce right through them. In Euro 2008, the England striker of yore was proved wrong. After 90 minutes at the Ernst Happel Stadium, it was the Spaniards and not the Germans who were left standing after a display of exhilarating possession football that wowed the world, not just in the final but throughout the tournament. It was the perfect cap to what has been one of the most engrossing tournaments in memory. High in quality, high in drama, the Euros have proved to be one of those watershed tournaments that you gage all future ones by. Small wonder it did so without the over-hyped English. Present were all elements to transcend the tournament into greatness. There was the early vanquishing of a giant (France), the mesmerizing genius of the prodigy (Dutch), the surprise package (Russia) and the dark horse (Croatia). There was also the perennial always-there (Germany) and the pondering Cyclops (Italy/Luca Toni?). Not to forget the fairytale run (Turkey). But most importantly, there was drama of the like hardly replicated in international tournaments. Teams came back from the death, they jabbed at each other like two boxers of equal dexterity and the best part of it was that they did it while playing good, tactical football. Kudos to the coaches for that. 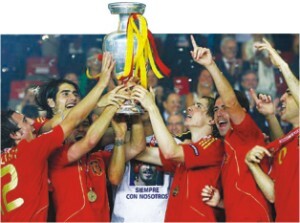 But Spain is what this tournament was about. Perennial under-achievers, the Spanish had in their possession (finally) a generation of players who did not crack when it came to the big time. Much was made of coach Luis Aragones' policy of not bringing in Raul, of employing the crafty Cesc Fabregas as a substitute, of repeatedly pulling off Fernando Torres or even brining such unheralded lights such as Dani Guiza or Santi Carzola. But the man who once labelled Theirry Henry a form of coloured excrement has perhaps finally lived that down. History will remember the brash Aragones as the man who finally delivered Spain a crown they had deserved much more than the once they had won it in 1964. And did Spain deserve it. They played a brand of football that wooed you from the beginning. The beguiling passing of their central midfielders, the blinding pace of Fernando Torres, the nifty work of David Villa, the surging runs of Sergio Ramos all facets that made this tournament into a watchable venture for many fans whose teams either hadn't made it or exited early. With Spain's lifting of the Henri Delauney trophy a nation of Catalans, Basques and other elements united into one if only for a while. But in the end football was the real winner. Nearly man: Michael Ballack that's a Euro final, a World Cup final and two Champions League final all lost. Maybe there is truth in numbers. Ballack wears 13. Candle in the dark: Arshavin of Russia, who shone so precociously in two games.